Special sneak peek for all of you! I’m wearing a prototype for my new design from my line, Coexist‘s new collection. I had a magazine shoot that day so I decided to wear my own design. I can’t wait to release this jacket! The jacket actually reminds me of royalty. Navy blue mixed with gold gives that sort of vibe, don’t you think? For my look though, instead of going all out prim and proper, I wore this shredded shirt under my Coexist jacket to take my look from the royals to the streets! I was actually really flattered when the owners of Rockn’ Soule later told me that this shirt was inspired by me. Thank you Andrea and Rain Â ! This shirt is shredded to perfection! Adding a little more ruggedness to my look is this belt from Tie-Ups. If you remember the belt I wore here, they both belong to the studded Tie–ups Glam Pins collection. 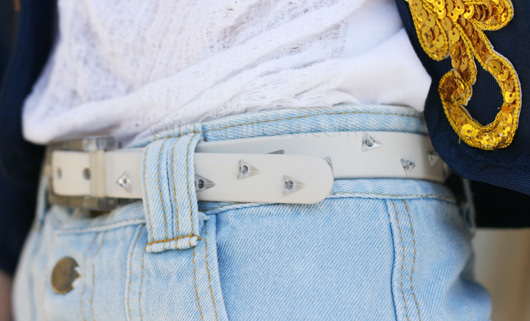 The only difference is this belt is thinner and its studs are pyramidal in shape. 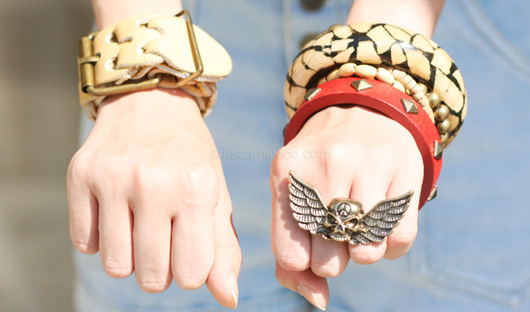 For my accessories, I played around with gold and red-colored accessories to tie all the elements together. 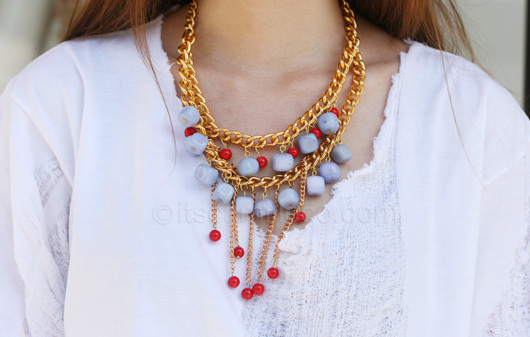 According to Tati, the brainchild behind Bubbles, this necklace was also inspired by me. Yay! Thank you, Tati! P.S. Have you voted for me at the Nuffnang Asia-Pacific Blog Awards for Best Fashion Blog? Please vote for me here. It would really mean a lot! You can vote once every 2 hours, meaning, multiple votes are allowed! :) Also, you don’t need to vote for all categories.